Small, balloon-like creatures with many tentacles for probing. The Pod infector, also more commonly known as the Flood infection form, is a stage of the virulent Flood xenoform. It is the most common Flood from and is usually the first forms to be released. It is the primary form for spreading the Flood infection due to its effectiveness compared to mere Flood spores when deployed in large numbers. Pod infectors are the primary vector for the Flood infection. While small (roughly the size of a human torso) and weak, they travel in huge swarms and overwhelm foes using sheer numbers. Once within range of a potential host, they leap for the victim's chest area, rasping away at armor, clothing and flesh with their numerous tentacle-like limbs. These appendages penetrate deep into the body, tap into the victim's spinal cord, and unleash an attack on the host's nervous system via direct contact with the spine, killing the host almost instantly. Once this is accomplished, the form rewrites the neural pathways of the victim's brain with its tendrils, forcing a resonant frequency match between its neural signals and the host's. At this point, the Pod infector has complete control over the body's motor functions. As the Pod infector hacks into the host's nervous system, it releases encapsulated Flood Super Cells into the body. These cells interface with the host's cells, "digest" them and convert their components into new Flood cells. At this point, the Pod infector burrows into the host body, moving aside the internal organs and taking up residence within the chest cavity (or any approximate equivalent). Having achieved total control over the host, the Pod infector reshapes the body into a form more suitable for attacking enemies - a combat form. Even if the Pod Infector is quickly removed from the host body, the injection of Flood cells into the host's system is enough to cause rapid transformation into spore-packed blisters. The speed and intensity of this process occurs at the same rate as an energetic chemical reaction, often taking mere seconds to accomplish. The consequences for the host organism are extreme, as their brains are purged of all traces of their original personality and their bodies are reconstituted into Flood biomatter. The organism effectively becomes a pawn of the Flood's collective intelligence, to be used in any way it deems necessary. In exceedingly rare cases, such as if the Pod infector has been damaged or is incredibly old, it will go through this process without killing the host, leaving them at least partially aware of what is going on, but unable to move or act. This was the fate of UNSC Private Wallace A. Jenkins during the raid on the "Covenant weapons cache" on Installation 04. 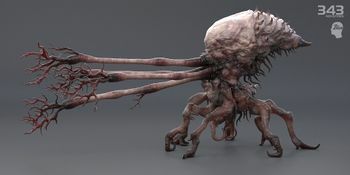 This aged version of the Pod infector must have been kept in captivity for far too long, thereby reducing its potential of complete transformation of its host into a Flood combat form. 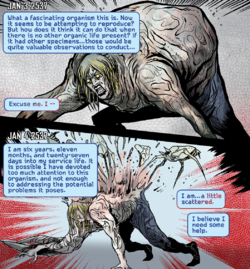 Jenkins survived infection, and even remained conscious, with short periods of time where he could exert control over his mutated body. A Pod infector may abandon its host if the corpse has been heavily damaged, and look for a new one. If the Pod infector inside a combat form has been destroyed, but the combat form itself is intact enough to continue serving its purpose, loose Pod infector may burrow inside the body and take the place of the one that mutated it, effectively "re-animating" the combat form. Pod infectors develop from a form vaguely resembling a larva or tadpole but bearing the basic superficial characteristics of a Pod infector. A number of Flood forms in this stage of their life cycle were kept in stasis by the Forerunners in Flood research facilities, such as the one in the Threshold gas mine. While an effective vector of infection against armored and shielded organisms as well as those equipped with atmospheric filters, a Pod infector is not necessary for the Flood to infect a host; merely ingesting Flood spores or inserting them via a wound is sufficient to initiate Flood conversion. Such infection may occur several seconds or perhaps minutes later, yet the transformation will occur almost instantaneously once it has begun. A carrier form spawning Pod infectors aboard the UNSC Spirit of Fire in 2537. While any large life form with some level of awareness and/or sentience can be infected by a Pod infector, not all of them are suitable to serve the function of Combat Forms, the Flood's signature and preferred mobile form utilized during the Feral Stage. While these hosts are transformed in a similar fashion to the traditional combat forms, these forms are not often employed in front line combat for several reasons. The first of these would be the fact that such life forms, despite their sophisticated nervous systems and adequate levels of sentience, simply lack the necessary biomass, calcium reserves, and physical strength to make first-choice combat units. More specifically, when a host life form is transformed, the activities of the Pod infector require not only the aforementioned levels of biomass, calcium content, and strength (Though humans become combat forms more often than the much larger and stronger unggoy for whatever reason.) but that the host has the physical endurance and stamina to withstand the process. Species such as humans, Forerunners, Sangheili, and the Jiralhanae are almost always turned into combat forms because their biology and physical properties enable them to withstand the Pod infectors' abilities, which are violent and resource-intensive. In contrast, other life forms, such as the Kig-Yar, and perhaps the Yanme'e, lack these important qualities, or in the case of the Unggoy have other limitations due to their physique despite their perfectly adequate levels of sentience and neural complexity. Because of these factors, these hosts are primarily used for other but equally important purposes. These involve multiple mission profiles that are essential to the development of Flood outgrowth: establishment of mobile incubators, biomass and calcium reserves, hive structures, and the components of a coordinating and controlling intelligence. When utilized for the creation of the hive and the central intelligence, the weaker hosts gather together and merge into single mass or a collection of masses spread around whatever environment the Flood have established themselves in. In this way, the weaker host forms serve as 'building blocks' for the creation of a Flood Hive, which if all goes according to its logical conclusion, will spawn a fully-developed collective and the next stage of the Flood's development: the Coordinated Stage and its crowning achievement, a Gravemind. Surrounding life forms such as significantly smaller animals as well as the full range of plants, microbes, lichens, and fungi, are seized by the growing Flood collective and digested as raw material to create more generic Flood biomass. The next vital use for lesser hosts is to serve as the second signature form of the Feral Stage, the mobile Pod infector incubator known as a Carrier Form. While these are usually formed from weakened, damaged, and/or aged Combat Forms, weaker host forms are just as frequently employed for this purpose. The first step in the creation of a Carrier Form by this method involves a single appropriate host to function as a nucleus, which is then followed by one or more other weaker forms attaching themselves to the leading unit. The congregated hosts then fuse, with the external host forms being rapidly digested by the central form, with the result being that the other hosts have been reduced to extra, generic biomass, contributing to the structure of the now significantly distorted, bloated incubator. While this complex methodology is largely standard procedure for the Flood, there are occasionally exceptions to these rules due to the Flood's adaptive nature. In at least one notable campaign early in the Human-Covenant War, this mode of operation was contradicted by the Flood. The outbreak present on this installation employed Kig-Yar and Unggoy quite frequently as front line combat units despite their inadequate status, and was also distinct from other outbreaks with the fact that it was predominantly formed out of life forms lacking sentience such as plants, fungi, etc., or those possessing lower levels of sentience, such as the wide range of animals living there. Energy shielding destroys Pod infectors on contact, causing them to explode in a small burst of gas and flesh. Conventional body armor is generally ineffective against Pod infectors; they can easily squeeze through gaps in armor plating, and their grasping tentacles can burrow through rubber, fabric or polymer (including MJLONIR MK V undersuits) in order to reach the flesh underneath. Staff Sergeant Avery Johnson was thought by Dr. Catherine Halsey to be incompatible with Flood Pod infectors due to the fictitious "Boren's Syndrome" — in reality a cover for the augmentations he received as part of the ORION Project. However, it is apparent that Johnson's augmentations did not make him truly immune to the Flood conversion process itself, instead granting him the ability to fight off and escape the parasite more effectively than the baseline humans alongside him. The Mgalekgolo's lack of a central nervous system and nature as an invertebrate colony consisting of multiple worms likely make them immune to Flood infection. The invertebrate nature of the Yanme'e, along with their hard, chitinous exoskeleton, would seem to make them immune as well. However, while their unique physiologies make standard infection difficult, it is likely that the Flood are still capable of consuming and converting Lekgolo and Yanme'e into Flood biomass. In Halo: Combat Evolved, if a Pod infector latches itself onto a Marine or one of the Covenant, instead of mutating the host, it will become irrevocably attached until the host is dead. If at least one Pod infector manages to leap onto an unshielded player in this game, it will deal a noticeable amount of damage (this will increase depending on difficulty and number of Pod infectors attached), fall off, and attempt to strike the player again. This effect on the player also appears in Halo 3. An energy sword will not lose energy by killing Pod infectors in Halo 2 and Halo 3, but this method is highly ineffective as Pod infectors are extremely hard to hit with an Energy Sword. Pod infectors do not add points to the player's meta-score when the campaign scoring is activated in Halo 3 and Halo: The Master Chief Collection. This is most likely because Pod infectors come in swarms, and could be used to rack up points with almost no effort. Unlike in Halo: Combat Evolved and Halo 2, the Pod infectors in Halo 3 float in water. Thus, they cannot infect corpses that are in water ponds because of this animation. In Halo Wars, when Sergeant Forge shoots the Flood Pod infectors that are attacking Professor Anders, they do not pop like all other Pod infectors. Instead, they simply fall lifelessly to the ground. In Halo 3, code exists for a deleted "banger" variant of Pod infector, which would explode like a plasma grenade when destroyed. In Halo: Combat Evolved, Pod infectors are not affected by fall damage, most likely due to the script or slow speed during freefall. Concept art of a Pod Infector from Halo: Combat Evolved. Flood Pod infector in Halo: Combat Evolved. In-game view of a Flood Pod infector in Halo: Combat Evolved. The Master Chief watches as Pod infectors prepare to consume a dead Elite and a dead Grunt. A Pod infector in the Threshold gas mine in Halo 2. A Pod infector in Halo 2. Pod infectors in Halo 3. A Pod infector in Halo Wars. Pod infectors assaulting Professor Anders. A pet Flood Pod infector which can be purchased as a feature for any Xbox 360 Avatar. An Xbox 360 Avatar customized with a Flood Pod infector suit. The Librarian investigating a Flood Pod infector in Halo 4's terminals. A Flood Pod infector inside the UNSC Spirit of Fire's cryo-room in Halo: Escalation. Flood Pod infectors in Halo: Spartan Assault. A Pod infector attacks the Prophet of Mercy, eventually killing him. Jerome-092 destroying a Pod infector in a single punch in Something has Happened. Models of the Pod infector for Halo Wars 2. Banished forces succumbing to a tidal wave of Pod Infectors. A Pod infector killed by a Banished Jiralhanae's Spiker in Halo Wars 2. Atriox crushes a Pod infector. ↑ Halo: Evolutions — "The Mona Lisa"
↑ YouTube: Halo 3 - Cut Enemy: Flood Infection "Banger"